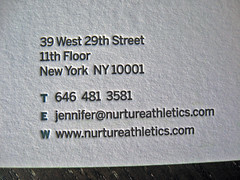 If you like letterpress and edge coloring then you’ll be a fan of these card we printed for Nurture Athletics, founded by Jennifer Landis. 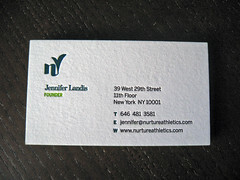 Jennifer worked with Cainkade, a creative agency based in NYC. 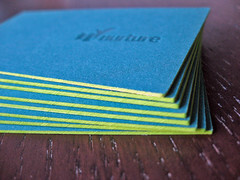 The cards are well rounded using just about every trick from offset printing, to foil stamping, letterpress, edge coloring and duplexing! 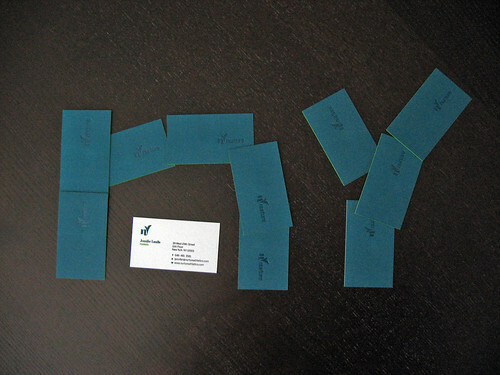 Check out all of the photos after the break. 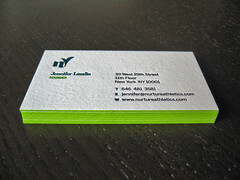 The business cards were double sided but we started with sheets of 110lb lettra in fluorescent white. 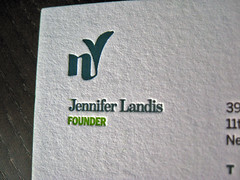 I tried my hardest to recreate the nurture logo with Jennifer’s cards above, I think that was a failed experiment! 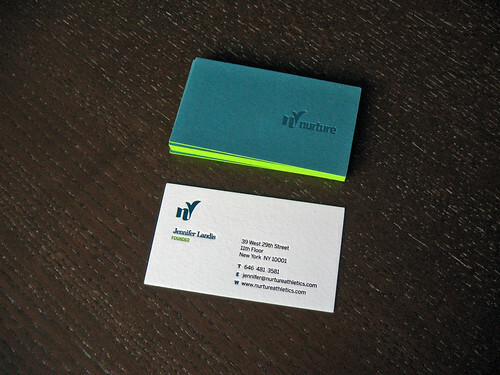 The front of the card was printed with a flood of green-blue ink. 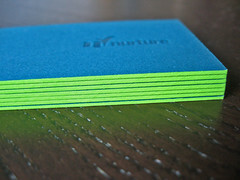 Normally we try to match a colored paper if the client wants a full flood, but the stock didn’t exist so we printed the solid on an offset press to get a pantone color match. 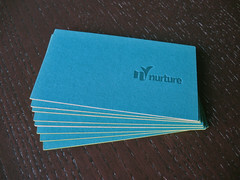 The nurture logo was foil stamped in a flat green pigment foil 1 shade darker than the paper for contrast. 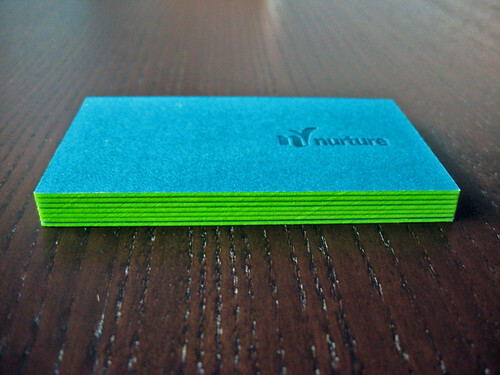 The back of the card was left white and foil stamped using the same green pigment foil for the nurture logo. 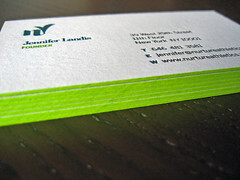 We letterpress printed the contact information in three colors: black, fluorescent green, and dark green (to match the foil). 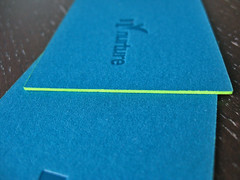 The edge coloring was done after duplexing the sheets to create a 220lb stock. 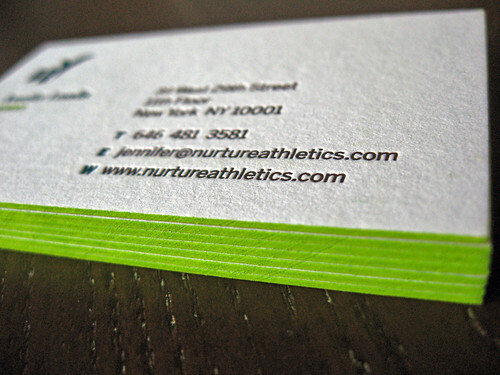 The finished cards were edged in a fluorescent green to match the light green ink used on the card. The finished piece is a great example of what different techniques can offer to a design without any one process overwhelming it. Email us (contact@dolcepress.com) for more information on all of the different techniques and embellishments we offer.